Sweet potatoes are ubiquitous around the holidays, but there are good reasons—beyond the fact that they're delicious—to make them a year-round staple. Because they contain tons of vitamins A and C and have anti-inflammatory properties, sweet potatoes can add a nutrient boost to all kinds of foods, from crispy hot latkes to cool panna cotta. Here, 15 smart ways to use them. 1. Hash. Sauté sweet potatoes with scallions and smoked paprika for a breakfast hash, then bake some eggs right on top. 2. Biscuits. Mash some sweets to add to cayenne-spiked biscuits. 3. Salads. Add them to quinoa with apples and baby kale for a fall superfood salad. 4. Gratins. Layer thinly sliced sweet potatoes with other root vegetables, cover with chicken stock and bake to make the world's healthiest and most delicious gratin. 5. Latkes. Grate sweet potatoes and fry them for a riff on potato latkes. 6. Twice-Baked. Make a grown-up twist on this steak house white-potato classic, using sweet potatoes topped with curry-puffed grains. 7. Grilled. After parboiling sweet potato wedges, pop them on the grill, which caramelizes the natural sugars beautifully and laces them with an incredible smoky flavor. 8. Miso-glazed. Instead of the usual sugary glaze, toss sweet potatoes with Japanese ingredients, like soy sauce, mirin and miso before roasting. 9. Oven fries. Cut sweet potatoes into wedges and roast for superhealthy steak fries. 10. Ceviche. To make ceviche more substantial, toss it with cooled cubes of cooked sweet potato, like star chef Gastón Acuria does. 11. Gnocchi. Turn sweet potatoes into gnocchi sauced with apple cider butter. 12. Quesadilla. To lighten up this classic bar snack, substitute mashed sweet potatoes for some of the cheese. 13. Pizza topping. Spread mashed sweet potatoes over pizza crust in place of tomato sauce. It's delicious with soppressata and balsamic onions. 14. Doughnuts. 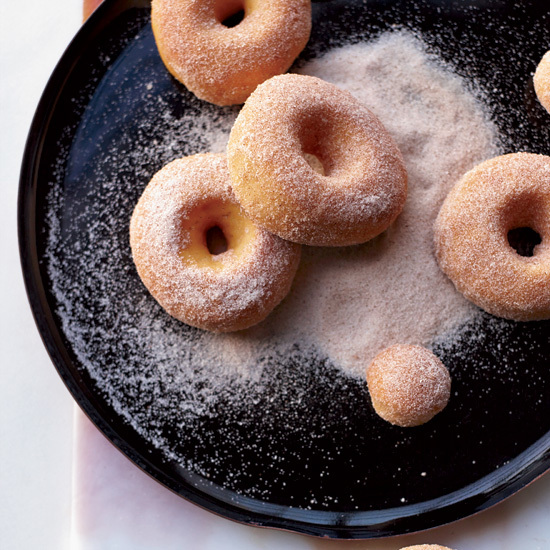 Make doughnuts slightly more virtuous by adding sweet potato puree and baking them. 15. Panna cotta. Use leftovers to make star pastry chef Christina Tosi's panna cotta.